The Supreme Court on Thursday expressed doubt over validity of the ordinance providing that states could hold their own entrance examination for admission to undergraduate medical courses for the current academic year bypassing the National Eligibility Entrance Test (NEET) but refused to interfere with its operation. Refusing to stay the operation of the ordinance as 50 percent of the states have already conducted their own entrance examination for admission to government medical colleges, a bench of Justice Anil R Dave, Justice Shiva Kirti Singh and Justice Adarsh Kumar Goel, however said: "Prima facie we find that the validity of the ordinance is open to doubt." NGO Sankalp had moved the top court seeking the stay of the ordinance contending that it was it was a patent exercise of judicial power in the garb of ordinance to put the court decision on hold for one year. Apparently unhappy with the government taking the ordinance route giving states the option of opting out of NEET for the academic session 2016-2017, the bench said: "That (ordinance) was not warranted. The purpose (of NEET) was uniform test with minimum standards." 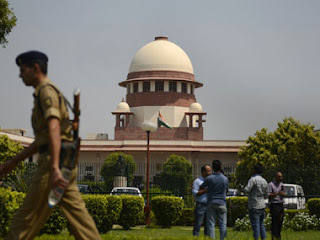 Holding that the issuance of an ordinance to derail the court order was not "proper" or a "good practice", the bench said: "Once NEET became operative, no other exam could have taken place." Justice Dave said that in view of the order of the court, "this should not have happened". Telling Attorney General Mukul Rohatgi that its 28 April and 9 May orders directing the admissions to undergraduate medical courses could be only through NEET, Justice Singh said that this was "not only in the students' interest but in the larger interest of the society so that doctors should be (of) some minimum standards". Urging the bench not to take issuance of the ordinance as an affront to the top court, Rohatgi told the bench that "government could have scrapped the NEET but it did not do it", noting it could have abolished NEET or changed the regulation providing for it but brought it as a law. "What heavens will fall if it (state-wise exams) is allowed this year," he said, urging the court to look at the physical side of the issue as it was not a matter concerning five or ten students but lakhs of students. He told the court that in Tamil Nadu, admissions have already taken place, in Gujarat list would be out on Friday and in Maharashtra, counselling is in progress. Addressing the court senior counsel Amarendra Sharan appearing for Sankalp told the court that the government action was "an attempt to defeat the order of this court". "Once the court has passed an order, no authority can block it or undo it," he said, noting that the government could not keep in abeyance the order of top court for one year. Pointing out that the corruption in admission was endemic across the country, senior counsel Vivek Tankha appearing for petitioner Anand Rai said that the government has made exception under pressure and even next year they would do so on another pretext.